Judgment Day has come and gone, leveling modern civilization. An army of Terminators roams the post-apocalyptic landscape, killing or collecting humans where they hide in the desolate cities and deserts. But small groups of survivors have organized into a Resistance, hiding in underground bunkers and striking when they can against an enemy force that vastly outnumbers them. Controlling the Terminators is the artificial intelligence network Skynet, which became self-aware 14 years earlier and, in the blink of an eye, turned on its creators, unleashing nuclear annihilation on an unsuspecting world. Only one man saw Judgment Day coming. One man, whose destiny has always been intertwined with the fate of human existence: John Connor (Christian Bale). Now the world is on the brink of the future that Connor has been warned about all his life. But something totally new has shaken his belief that humanity stands a chance of winning this war: the appearance of Marcus Wright (Sam Worthington), a stranger from the past whose last memory is of being on death row before awakening in this strange, new world. Connor must decide whether Marcus can be trusted. 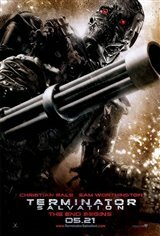 But as Skynet adapts new strategies to end the Resistance forever, Connor and Marcus must find common ground to take a stand against the onslaughtto infiltrate Skynet and meet the enemy head-on.